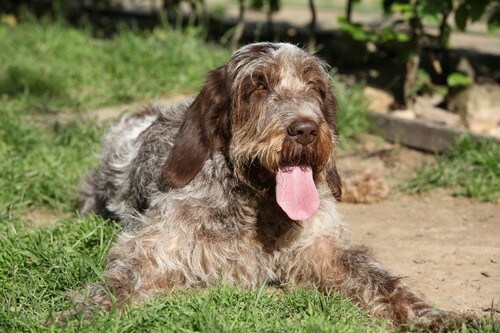 It should come as no surprise that the Wirehaired Pointing Griffon is a loving and devoted dog. You can see it in his small, soft eyes that seem to only have room enough for love in them. However, the Griff also has a rough, hardworking side to him, too – a side that is matched by his rugged, and naturally bedraggled appearance. It may be important to note just how messy an adult Griff can look. This is because they grow up to look wildly different from how they look like puppies. This can throw off some folks who would rather own a “beautiful” dog. But, as we all know, beauty is in the eye of the beholder – and in the temperament of the dog. The Griffon earned his nickname for his energy level and natural intelligence. He's just as good at being a hunting dog as he is at being the family dog. The Griffon makes a great companion for those who love being active and playing sports. He'll be right there with you, hiking, jogging, or playing fetch. And because he's a hunting dog, he's pretty good at playing fetch. He may be slow to start, but that's only because he's measuring his time, waiting for the “prey” to land before he points, sets, and retrieves. When it comes to kids, the Griffon does well, though he tends to do better with older children. However, if a younger child is taught how to interact properly with the Griffon, and knows better than to pull his tail or shove things in his ears, then the Griffon should do well with them, too. Children should always be supervised when they're around the family pet. Children can be just as unpredictable in these situations as animals, so it's best to keep an eye out to make sure that no one accidentally gets hurt. The truth is, it looks more difficult to groom a Griff than it is to actually get down to the business of doing it. He doesn't shed much, and his shorter coat dries fairly quickly after a bath. You may want to brush him weekly anyway, just to free any dirt that may become trapped. You'll also need to pluck out any of the Griff's dead hairs. This is a process known as “rolling” or “stripping” the coat. As for baths, he doesn't really need the standard dog bath. No soap required. Just rinse him off with some fresh water, and he's good to go, especially if he's been playing in the ocean or a chlorinated pool. Other than that, his coat is fairly self-cleaning. The remainder of his care is the same as that of any dog: trim his nails, keep his ears clean, and be sure to brush his teeth regularly. Most intelligent breeds are a chore to train because with that intelligence comes a fair degree of stubbornness. Not so with the Griffon. He loves to learn, and more than anything, he wants to please his master. Many breeds are easily distracted during training or couple their intelligence with a side of pigheadedness. 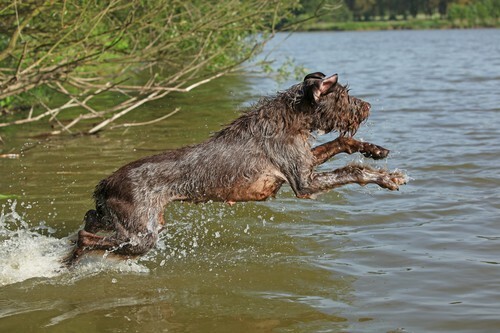 This is yet another area where the Griffon excels as a breed. Because the Griffon is eager to please and excited to learn, all you really need to do to train him is, as always, remain consistent, and use hand signals and vocal commands. Those are all you really need to keep him focused. In a way, the Griffon is like a college kid. While other breeds may be like high school kids in that they aren't as interested in learning because they're forced to be there. The Griffon is here to soak up all he can because he wants to be here. You don't have to worry too much about the Griff's health. On average, he is less prone to diseases than other breeds can be. The only real issues seen commonly in this breed are hip dysplasia, which affects nearly if not all breeds, and eye issues – that's about it. Of course, don't discount any signs of something being amiss. Just because it isn't common, doesn't mean it's not possible. And, as with any breed, take care not to overindulge the Griffon with treats or by overfeeding him. If you allow him to become overweight, this can lead to a host of health problems that could otherwise be avoided. A Griff's average lifespan is about 12 to 14 years. 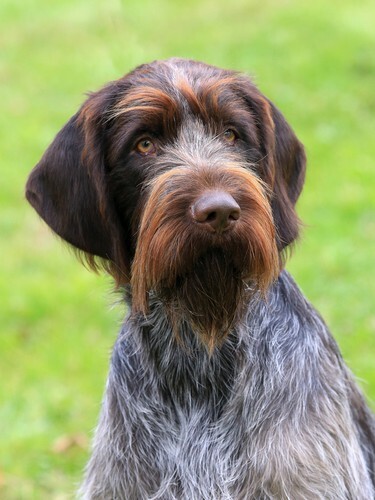 The Wirehaired Pointing Griffon is a treat of a dog. He's loving and loyal, and he's a great hunting dog. He doesn't require much grooming, and he's great with kids, so long as the kids are made aware of how to properly treat an animal. He is a joy to train, as he wants nothing more than to make his master happy. A few hand signals and vocal cues, and he's good to go. He is not vulnerable to many diseases, so the Griff is, on average, a very healthy breed. And he should be expected to live a long and healthy life, with a life expectancy of between 12 to 14 years.